A phenomenally preserved verdant oasis in Maharashtra, Nagzira Wildlife Sanctuary is a significant region from the point of view of biodiversity conservation. This wildlife empyrean is encapsulated in the arms of nature and festooned with scenic vistas, lush vegetation and serves up as a magnificent destination to explore the exquisiteness of nature. Nagzira Wildlife Sanctuary is in fact an unparalleled gem of nature and bestows every wildlife traveler to relish the serenity and wilderness spread all over in the sanctuary. The forests of Nagzira Wildlife Sanctuary were once ruled by the Gond kings. The area was declared as a wildlife sanctuary in the year 1970. The sanctuary was brought under the charge of Deputy Conservator of Forests, Nagpur in the year 1984. 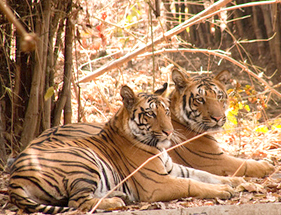 The state government of Maharashtra announced in 2012 to include this region under Project Tiger. The total area of this park is approx. 152.81 square kilometers. The sanctuary is located in the Bhandara and Gondia District of Maharashtra. Geographically, the region of this sanctuary falls under the Nagpur Circle of State Forest Department. The management and administration of this sanctuary is under the control of Chief Conservator of Forest (Wildlife), Nagpur. The comprehensive area of this beautiful sanctuary comes under Nagzira Range. Nagzira Wildlife Sanctuary is an abode to lots of endangered species of flora and fauna. There are about 34 mammal species, 166 avifauna species, 4 amphibian species and 36 reptile species found in the park. The major mammal species found in the park are Tiger, Palm Civet, Small Indian Civet, Jungle Cat, Panther, Sloth Beer, Gaur, Common Giant Flying Squirrel, Mouse Deer, Gaur, Pangolin, Four Horned Antelope and Ratel. The main avifauna species found in the sanctuary are bar-headed goose, peafowl, etc. The major reptilian and amphibian species here are Indian Rock Python, Indian Cobra, Dhaman, Checkered Keelback, Russell's Viper, Common Monitor, Bull-Frog, Tree Frog, Six-toed Frog, etc. One can also enjoy elephant ride in the sanctuary. In addition to this, the flora of the sanctuary is also varied as it carries opaque expanses of mix forests, teak forests, bamboo trees and grasslands. At present, a small museum is located inside Nagzira Tourist Complex. This museum is used for conservation education of the travelers. Varieties of stuffed birds can be seen here in showcases. There are present audiovisual materials in the interpretation center at the complex. Moreover, there are 5 watchtowers and 5 watch cabins within the sanctuary. The Mahadev Temple at Pongezara borders the sanctuary. This temple attracts hordes of people at the time of Mahashivratri. The sanctuary remains open for the tourists from October to June. There are several comfortable and clean forest guest houses available within the reserve offering cozy accommodation. There is also the availability of food inside the reserve. By Road: The sanctuary is positioned almost 19 kilometers from Sakoli on NH-6 (Mumbai-Kolkata). Nearest bus stand from the sanctuary is at Sakoli and Tirora. By Rail: Tirora Railway Station (19 kilometers) is the nearest railhead from the sanctuary. By Air: Nagpur Airport (139 kilometers) is the nearest airport from Nagzira.